Why visit a meditation studio? Why not learn meditation on your own, such as through an app or online video? While these tools can complement learning, face-to-face interaction makes for lasting personal change. In addition, MDitate offers so much more than just guided meditation classes. We meditate too, but we are not saints, we are not yogis, and we are not monks. Practicing and guiding meditation is just part of our busy lives, but we still make it a daily priority because we are on a lifelong journey of personal growth. We are grateful for your support, and part of our journey is supporting your personal growth as well. Consistent meditation leads to an almost indescribable, but very tangible sense of inner calm and emotional peace. Sometimes you feel the potent effects of meditation when, ironically, you stop consistently meditating (for whatever reason), and this gentle reminder motivates us back to a routine. Meditation techniques vary depending on their tradition and aim, as well as the approach and creativity of the guide or teacher. Techniques include breathe, body sensation, sound, mantras (a word or sound), and even movement. See what MDitate offers here. There is no one style or method of meditation that is "better" than the other. What appeals to you may not appeal to your neighbor. 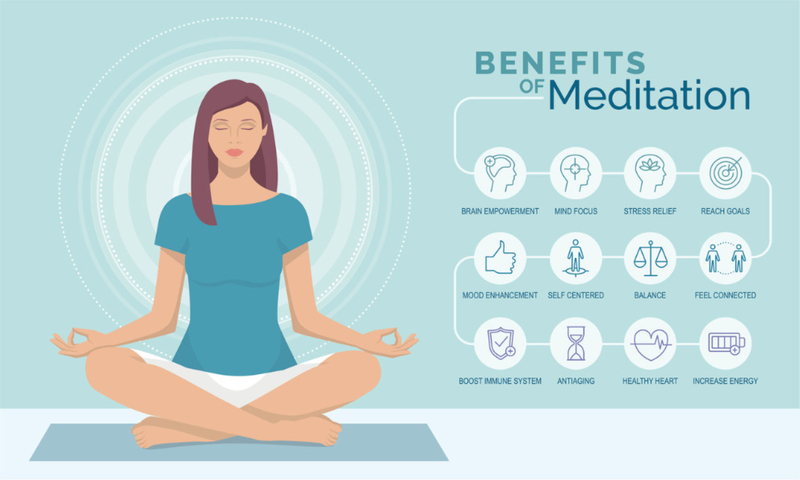 You don't have to hear from a doctor to know that meditating is good for you. While meditation is a powerful antidote to stress, the evidence confirms that it is so much more than a way to relax. Meditation is a complement to a healthy lifestyle that includes eating well, socializing with family and friends, and regular activity. Meditation can be thought of as a mental workout. It trains a part of our mind like exercise tones and builds muscle. The paradox is that through "exercising" the mind, that is, by training it to hush its chatter during meditation, we discover how refreshingly clear, more focused, and more serene we become when we aren't meditating. Like a workout, phenomenal benefits are earned through making the practice a habit, part of your daily routine. Through practice, we tone our meditation muscle. What emerges over time is a newfound ability to navigate the ups and downs of the day. And, similar to exercise (you knew this was coming!) meditation can at times get a little uncomfortable. While we need discipline to persist, the practice of any art needs a support system to keep it fun and fresh! That's why guided meditation with devoted people can be so valuable.